$2 Health Buck coupon to purchase additional fruits and vegetables. 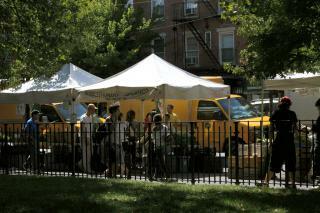 Located along the southwest corner of the East Village's gathering ground, Tompkins Square Park, this year-round Greenmarket brings local food to the neighborhood every Sunday. Specialty produce, orchard fruit and berries, live plants and flowers, eggs, glass bottled milk, farmstead cheese, meat, baked goods, honey, and maple syrup are all on offer. Catch up with your neighbors, meet the folks who grow and raise your food, and enjoy free seasonal cooking demonstrations and events.